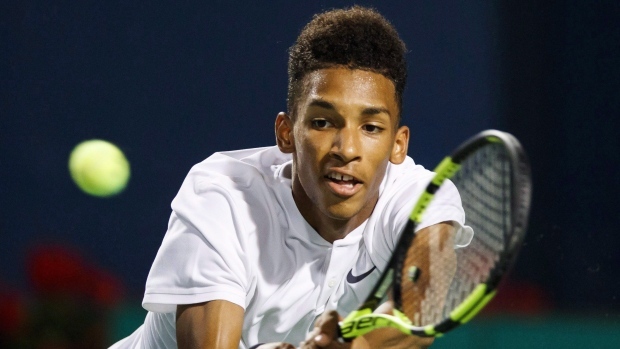 MIAMI, Canada — Canadian teenager Felix Auger-Aliassime advanced to the final round of qualifying at the Miami Open tennis tournament with a 4-6, 6-4, 6-1 win over Italy's Luca Vanni. The 18-year-old from Montreal had nine aces in the match and saved 13-of-16 break points he faced, while converting five of his 10 break point opportunities. Auger-Aliassime, ranked second in the qualifying draw and 57th in the world, next faces world No. 107 Paolo Lorenzi of Italy for a spot in the main draw. The Canadian is looking to continue his successful 2019 season, which includes an appearance in the final of the Rio Open last month. Earlier, Peter Polansky of Thornhill, Ont., was defeated 7-6 (4), 7-5 by fourth-seeded American Mackenzie McDonald. Eugenie Bouchard of Westmount, Que., the second seed in women's qualifying, was upset 4-6, 6-0, 6-4 by Japan's Nao Hibino. Bianca Andreescu of Mississauga, Ont., a winner last week at Indian Wells, is in the women's main draw. Milos Raonic of Thornhill (12) and Denis Shapovalov of Richmond Hill, Ont., (20) are seeded in the men's main draw and have first-round byes.